There won’t be anything meaningless to the New York Rangers about the last nine games – especially for young center Lias Andersson. The Blueshirts won’t be going to the playoffs for the second straight season – the first time since 2003-04 they’ll miss the tournament in consecutive years. Yet, for young and older alike on this rebuilding team, the final stretch will play an important role in forging team management’s decision on who goes and who stays, who is viewed as a part of the future and who is a stopgap to better times at Madison Square Garden. Among the youth, it’s possible that no one has more to gain over the next few weeks than Andersson, the seventh overall pick in the 2017 draft who was a controversial selection at that spot and has done little to disprove those sentiments in his limited time with the Rangers. The Blueshirts picking Andersson so high raised some eyebrows at the time. Though the Swedish center was well thought of amongst many teams at that draft, the more highly rated center Casey Mittelstadt was available when the Rangers made their pick. Though Mittelstadt, selected by the Buffalo Sabres with the pick after Andersson, has hardly leapt to stardom yet, his 11 goals and 11 assists in 69 games this season show that he appears to be successfully acclimating to the NHL, albeit slowly. The same can’t be said to this point for Andersson. He’s played 40 games over the past two seasons and recorded two goals and five assists, while recording a minus-13 rating. He’s a minus-14 in 33 contests this season alone. As a result, it appears prove-it time is arriving more quickly for Andersson than for some of his teammates. Amongst the Rangers’ group of young centers – Andersson, Brett Howden, Filip Chytil (a natural pivot who has played extensively on the wing but is expected to permanently move back to the middle eventually) and Boo Nieves, only Andersson has failed to “flash” at some point. There’s been no impressive stretch of play highlighting what he can do, no signs that potential is on the verge of beginning the often-slow-but-steady process of becoming production. Calling Andersson a bust after just 40 games wouldn’t be fair or accurate. Worrisome for the Rangers, though, is the sample size of games is large enough for him to have shown … something. That hasn’t happened. Andersson isn’t a dynamic skater, and while he’s shown decent hands and touch around the net, the skills with the puck don’t appear to be elite overall. If speed or high-end offensive ability don’t emerge, what do the Rangers hope to get out of him? Andersson lacks the exciting offensive upside and skating acumen of Chytil – chosen 14 spots after Andersson by the Rangers two years ago. He hasn’t exhibited Howden’s awareness, puck sense and elusiveness. Nieves might be ticketed for a career on the fourth line, but his speed, size and physicality should play well in that role and perhaps eventually as an effective penalty killer. Each center has delivered glimpses of those skills – except Andersson. The 20-year-old does possess a solid two-way game, a strong work ethic and an element of grind and edge – attributes, however, that haven’t equated to effectiveness at the NHL level so far. It’s important to note that Andersson hasn’t been afforded nearly as much of an opportunity as the other three young centers, playing fewer games than all of them and manning the wing at times this season – where, unlike the natural scorer Chytil, his game simply doesn’t translate. Plus, Andersson is averaging only 10:14 of ice time, compared to Chytil (13:45) and Howden (14:56). However, Andersson’s mark does exceed the more productive Nieves’ 9:21. Now, Andersson is getting the opportunity, likely the best of his young career, to close the gap amongst his Ranger peers in the middle. Coach David Quinn moved Ryan Strome from center to the wing starting with Tuesday’s 3-2 home loss to the Detroit Red Wings, allowing Andersson to slide in and ostensibly audition for much if not all of the final 10 matches. He skated with Jimmy Vesey and Brendan Lemieux on the third line in the opener of this prove-it final stretch, finishing at minus-one in 10:45 of ice with one shot on goal. The timing of his chance is hardly a coincidence, and Andersson has to know how critical this short run of games might be to his career. Show the organization something, and he’ll find himself in competition with Chytil, Howden and Nieves for the three center spots behind Mika Zibanejad at training camp in the fall – an outcome the front office is undoubtedly rooting for, given Andersson’s status as a top-10 pick. “It’s a slippery slope,” coach David Quinn said of his approach to Andersson over the final stretch. “Part of development is understanding you have to earn everything you get. Given his lofty draft status, management ideally would also like to see Andersson earn himself a top-six role. Realistically though, how likely does that seem, even at such a young age? Andersson simply hasn’t exhibited anything to this point to suggest he’ll ever be that effective. Chytil’s development has been rocky at times, but there’s little question regarding his potential to grow into a top-six center. Howden looks the part of a perfect third-line pivot, providing some offense as well as sound play in his own end. If Nieves grows into the role of prototypical fourth-line center, where does that leave Andersson? The other three centers, of course, come with clear potential – not guarantees. 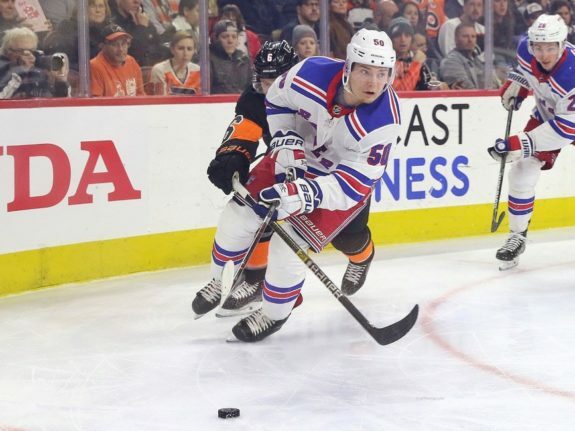 Getting his first true extended look, Andersson could start putting it together as the 2018-19 season winds down – his learning curve perhaps considerably longer than those of some of his Rangers peers. If he fails to flash over the final nine contests, though, Andersson’s future with the Rangers could fall into murky limbo. He’ll have more to prove than the others in order to make the team next season, and the doubts about his abilities will become more pronounced. Quinn has given Andersson a golden opportunity to avoid such a situation. 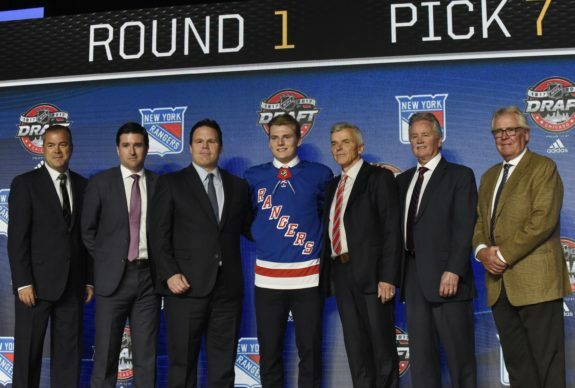 As a result, the Rangers may know plenty more about what the future holds for their still-prized draft pick by the end of the first week of April.